With the Toronto Maple Leafs and other Canadian NHL team's clinching playoff spots this month, hockey fever is definitely in the air! Hockey is one of a few sports that can bring a small town, city and nation together. Beartown by Fredrik Backman is founded on this sense of community. Giveaway time!! The lovely team at Simon & Schuster Canada was gracious enough to sponsor a giveaway on my blog. 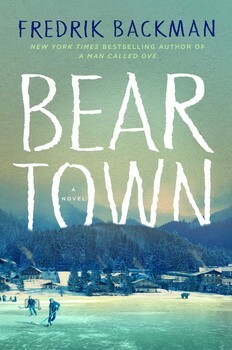 One lucky winner will receive a finished copy of Beartown by Fredrik Backman. Complete one or all of the raffle entries below for a chance to win! I haven't read anything by Fredrik Backman before... but I've been meaning to check out his books for a while now. Beartown sounds really interesting! I haven't either. The premise sounds intriguing. I'm excited to crack it open. If you're trying to BUY bitcoins online, Paxful is the #1 source for bitcoins as it allows buying bitcoins by 100's of payment methods, such as MoneyGram, Western Union, PayPal, Credit Card and even exchanging your gift cards for bitcoins.